We’re at the dinner table, and my son lobs this grenade as nonchalantly as if he’d asked, like he sometimes does, “Is this fish or chicken?” Hmmm … a teaching moment. I need to come up with someone admirable, an altruistic role model for an impressionable tween. But all I can think of is one name. That’s right. Bruuuce. The Boss. New Jersey’s favorite son (sorry, Frank, you went Palm Springs and never came back.) No Mother Teresa, certainly — though his support of food banks has filled many a hungry belly; and his stature has transcended the rock arena, as evidenced by his recent invitation to join the Obamas on their island-hopping tour of French Polynesia with fellow yacht-mates Oprah and Tom Hanks. But his politics have stirred their share of controversy, such as his duet on Pittsburgh rocker Joe Grushecky’s new Trump protest song, That’s What Makes Us Great. Springsteen was my first thought because the thought had crossed my mind before — each time I watched the standout 1978 Phoenix concert video of Rosalita (Come Out Tonight), his tour de force of romantic emancipation. That skinny, young troubadour was just having TOO MUCH FUN — revved by his killer E Street Band, swirling about the stage, jousting playfully with “Big Man” saxophonist Clarence Clemons, spouting breathless, liberating poetry, mobbed by female fans who’d rushed the stage. You could see it in his face — it was ecstatic. I wanted to have that kind of fun, to be that kind of cool, to be that Bruce Springsteen. Little did I know the rabbit hole he’d plunge into just a few years afterwards or how much deeper he’d fall later in life. Shortly after my sixtieth I slipped into a depression … [that] lasted for a year and a half and devastated me, Springsteen writes in his recent memoir, Born to Run. During these periods I can be cruel: I run, I dodge, I weave, I disappear, I rarely apologize, and all the while [wife] Patti holds down the fort as I’m trying to burn it down. She gets me to the doctors and says, ‘This man needs a pill.’ I do. I’ve been on antidepressants for the last twelve to fifteen years of my life, and … they have given me a life I would not have been able to maintain without them…. I was crushed between sixty and sixty-two, good for a year and out again from sixty-three to sixty-four. Not a good record. That’s just one startling admission from a book that had its serendipitous genesis at his home here in Wellington in 2009 when he simply started scribbling stories from his life. His often-playful prose fuses a hipster eloquence with the kinetic imagery and drama that stokes much of his music with cinematic and operatic intensity. Of course, there are intriguing sneak-peeks, like his years scrounging as a homeless artist on the Jersey Shore — now nearly unimaginable considering his four estates. Or Sinatra’s 80th birthday party when he found himself around the piano with — hallucination alert! — Bob Dylan and Steve and Eydie Gorme. But it’s the book’s reveals about his decades-long struggle with mental illness that really created the buzz. Published in September by Simon & Schuster, it’s packaged with a retrospective CD, Chapter and Verse, in effect the 67-year-old artist’s latest release. The next is reported to drop this year, his first all-new collection of songs since 2012’s Grammy-nominated Wrecking Ball. It’ll mark a departure for rock’s blue-collar poet laureate — having been inspired, as he’s said, by “pop records with a lot of strings and instrumentation” — and as such surely holds a tentative fascination for Springsteen devotees like me. Coming from working-class Jersey, I’ve been following the “new Dylan” since 1973, when I tore open an advance review copy of his debut, Greetings From Asbury Park, N.J., and I’ve stuck with him across nearly five decades of some of rock’s most dynamic music. True, while sonically more sophisticated, his later recordings may have put on some weight. But onstage the man who’s never worked as anything but a musician, the man who basically was born to play, is still the good-time force of nature he’s always been, still exulting in his eminence as the soul-surviving incarnation of rock ’n’ roll rapture — the transcendent euphoria of it, the “religious” revivalism of it, the plain old fun of it. I nose-dived like the diving horse at the old Atlantic City steel pier into a sloshing tub of grief and tears the likes of which I’d never experienced before. TEARS! Buckets of ’em, oceans of ’em, cold, black tears pouring down my face like tidewater rushing over Niagara during any and all hours of the day…. There was NO stopping it. Bambi tears … Old Yeller tears … Fried Green Tomatoes tears … rain … tears … sun … tears … I can’t find my keys … tears…. A kindly elderly woman walking her dog along the beach [one] beautiful fall day saw my distress and came up to see if there was anything she could do. Whaaaaaaaaaa. Since his first “breakdown” on a cross-country trip 35 years ago, Springsteen remarkably has never publicly fit the depression stereotype. His troubled mind may not have been a secret — i.e., This Depression from Wrecking Ball. But the revelations of Born to Run — the abyss of dysfunction, the nakedness of confession, the tears on the tracks — still struck with cold-cocked punch. And intended or not, they may take some of the sting from the public stigma of emotional issues. “Springsteen’s disclosure is arguably unique because his image runs counter to stereotypes of depression,” says University of Minnesota music professor Alex Lubet in a Newsweek opinion piece. He cites psychiatrists’ studies showing stigma is a major reason why most mental illness goes untreated. To be sure, there is a darkness on the edge of Springsteen’s work. For every Glory Days, there’s a Johnny 99. His catalog is a roulette wheel of emotions, many of its numbers shadowed with conflicted lyrics, dirge-like melodies and stark vocals — harsh, compelling songs of familial and societal scrutiny, like Independence Day, American Skin (41 Shots) and, yes, Born in the USA. But often even amid the bleakest landscapes, such as the 9/11 aftershock of The Rising, he climbs his way to catharsis, if not redemption. More to the point, the stage is Springsteen’s salvation. He remains an imposing international draw, up for Top Touring Artist and Top Rock Tour at the May 21 Billboard Music Awards. And onstage, demons at bay, his prove-it-all-night persona is still one of exuberance, control, triumph, the most commanding of live performers … the Boss. Mild post-tour depression can usually be expected…. But the crash I experienced this time was something else altogether. I was so profoundly uncomfortable in my own skin that I just wanted OUT…. Standing … walking … sitting down … everything brought waves of an agitated anxiety that I’d spend every waking minute trying to dispel…. I’d spend the day trying to find a position I would feel all right in for the next few minutes…. I’d pace the room looking for the twelve square inches of carpet where I might find release…. This lasted for six weeks…. I was a walking husk. Springsteen’s relatively private family life sounded no public alarms. Patti Scialfa has been his rock-steady wife for 26 years. The solo artist and E-Streeter studied at the University of Miami’s jazz conservatory in the early ’70s. They have grown sons, Evan and Sam, and a daughter, Jessica, 25, an accomplished show-jumper who’s the catalyst for the couple keeping a seven-bath home in the equestrian enclave of Wellington — as well as a high-enough profile there to have been honorary chairs at last year’s “Rockin’ Rio” Olympics fundraiser. “I literally play for horse feed night after night,” he said after performing at that event, referencing his alter-ego at his nearly 400-acre equestrian spread in Colts Neck, N.J.
One evening my father was giving me a few boxing lessons in the living room. I was flattered by his attention…. Things were going well. And then he threw a few open-palmed punches to my face that landed just a little too hard. It stung; I wasn’t hurt, but a line had been crossed…. We had slipped into the dark nether land beyond father and son. I sensed what was being said: ‘I was an intruder, a stranger, a competitor in our home and a fearful disappointment.’ My heart broke and I crumpled. He walked away in disgust. Why did Springsteen bare his soul about his problems? 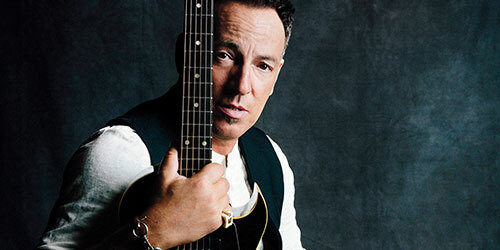 Now that his autobiography is wrapped, the apparently legacy-minded rocker this year counted-off The Bruce Springsteen Archives and Center for American Music at Monmouth (N.J.) University. It may never be cataloged there, but perhaps part of that legacy will be the inspiration others take from the rock superhero who came out about his kryptonite. Others like me, the admitted Springsteen “wanna-be,” who not purely by coincidence is now seeing a therapist.